In this video we are making the ‘Summer Fun Fat Quarter Skirt’ made with some gorgeous polkadot Fat Quarters from my @PinkSewingBus partners @Hobbycraft. 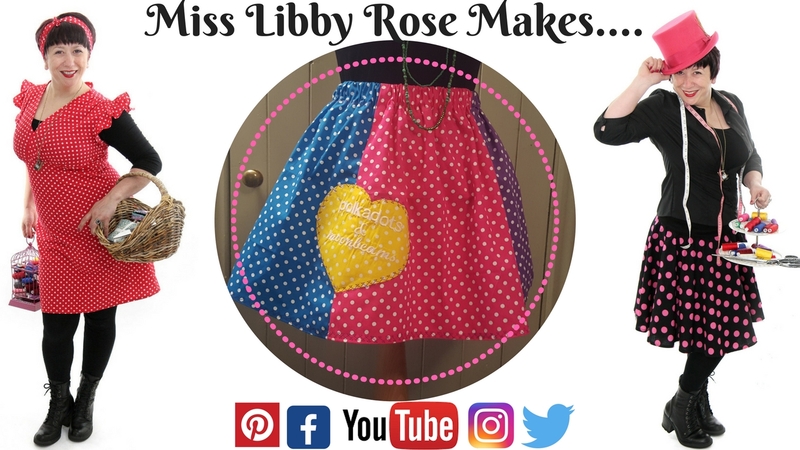 Join me @MissLibbyRose as I guide you through how to make this fun and skirt. Print out patterns at A4 size and stick them together as instructed on the pattern piece. You can cut more at this stage if you know you will definitely want a larger skirt. You will try it on for size in a short while so you can cut more then or we can say now that 2 x more fat quarters for a size 12-14. Be brave and bold with your fat quarters you can go clashy or matchy – the choice is yours! In contrasting fabric, cut out the heart (or other fabric shape) piece for the appliqué with matching bondaweb or heat n bond. Measure your elastic piece by slightly stretching it around your model and overlapping it by an inch. Put the elastic aside for a later stage. Lay the first fat quarter piece on top of the second piece so the right sides are facing each other & pin along the straight (diagonal) lines. Leaving a 1cm to 1.5cm seam allowance stitch the long seam. Open the seam and lay your next piece on top with right sides together, pin and stitch. Carry on the above method until all the fat quarters are joined. Wrap the long piece around your subject, participant or model and check that the pieces overlap each other with room as the elastic will gather or ruche it all together, you dont want it tight at the top! You can now add more fat quarter panels if required and once you are happy that you have a nice overlap you can stitch the final seam so you have a circular shape. At this stage it is good practice to go back to your seams and zig zag close to the seams raw edges so you will stop any fraying at a later stage. Press flat all seams flat. Apply your appliqué fabric piece in your chosen position by using the iron and following the instructions on the heat n bond or bondaweb. Stitch around the edge of the appliqué using a zig zag or fancy stitch. Go to the top of the skirt to create the elasticated waist-band. Fold down the top of the skirt first of all 1cm and press this flat. Fold down the top of the skirt a further gap so your elastic will slide through nicely. Not too tight here add an extra 1cm if you are not sure. Press and pin this fold down so the seams match up and don’t worry if you create any pleats or gather to make the seams match each other and fit. This will be disguised later in the elastic ruching. Using straight stitch or a fancy stitch now it is time to sew within the 1cm turn up following the edge of your presser foot against the edge of the fabric turn up. You are creating a channel at the top of the skirt, leave a gap (enough to thread your elastic through) before you meet yourself back to the start of the stitching. Take your elastic and safety pin one end to the edge of the hole in the waistband. Safety pin the end of the elastic and push through the channel until you meet yourself back at the start. Pull out both pieces of elastic so you are creating the gather / ruching. Ensure the elastic has not twisted at any point. Once you are happy sew up the elastic using a zig zag stitch so it can ‘ping’ back into the waist-band channel. Lastly the hem… go to the bottom of the skirt and ensure you are happy with the length. Adjust if necessary. Iron a rolled style hem by folding up 1cm and then another 1cm. Iron, pin and sew using the edge of your presser foot against the edge of your fabric as a guide.